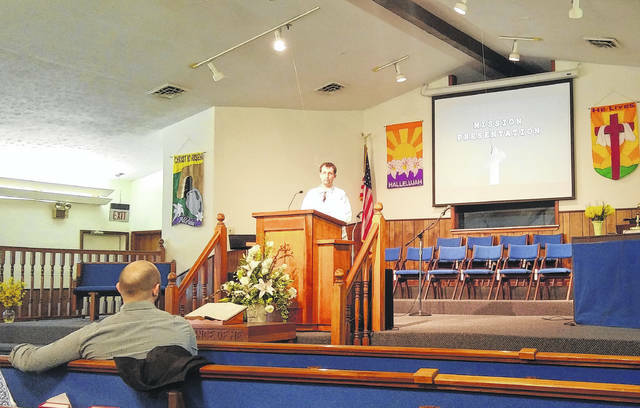 Cameron Armstong, a missionary to Romania visited Good News Baptist Church Wednesday evening and shared about his experiences working in a country that doesn’t speak their language and a culture different from what they know. GALLIPOLIS — Good News Baptist Church hosted three special guests Wednesday evening, guests who have been living in Romania for over five years. The purpose of their visit is to share their stories in the mission field with the church, who helps support their work through the Southern Baptist Cooperative Giving Program (CP). Cameron and Jessica Armstrong, and their two-year old daughter Sara are missionaries with the International Missions Board (IMB) of the Southern Baptist Convention (SBC). According to Cameron and Jessica, their work largely consists of two main areas, theological education and supporting the local church in Bucharest, where they live. The normal model for IMB missionaries is to work in the field for an extended period of time, two or more years, then take a furlough to come back to the states for several months before returning to the mission field. The Armstrongs had been in country for three years, taking a six month furlough to visit with friends and family, as well as to visit various churches across the country sharing about their work. Part of the reason they came to Good News, of all the SBC churches, is their friendship with Pastor Eric Fannin and his wife Sarah, whom they met while in seminary at Southeastern Seminary in Wake Forest. “It’s a pleasure to have them with us, and Cameron and Jessica have been friends of ours since seminary and we are glad to have them and their baby Sara with us,” said Fannin. The Armstrongs live in central Bucharest and help teach at the seminary there, as well as serving their local church, Apogia. Apogia is six years old and was a small church plant of 12 people when the Amstrongs arrived. “Its grown from a small plant of 12 members to now where we average about 40 in attendance on Sundays, but we also just heard they had 80 for Easter so we’re really excited about that,” said Jessica. Part of Cameron’s work includes teaching theological evangelism classes to natives in Romania and mentoring students in the seminary. Jessica, who taught math in America for five years before moving to Romania, also teaches English to students in country. “During the first semester we wrestle with questions about theology of evangelism. What is the Gospel, why do we share the Gospel? The second semester is more practical based where we go out together and share the Gospel with other people,” said Cameron. The Armstrongs related their work to those in attendance, hoping to help encourage them in their own faith and assure them of the need for their CP giving to further the mission of the church. Good News gives part of its weekly giving to the CP, as well as a special season of giving to the CP during the Lottie Moon Offering, which happens during the Christmas season and is specially marked for the IMB and international missions. The biggest question church members at Good News had was about the obstacles that get in the way of the Armstrong’s mission. Jessica, originally from Charleston, W.Va., and Cameron last visited the states and Good News Baptist Church over three years ago, and will head back to Romania and their mission field in the coming days. To learn more about the IMB, Southern Baptist Missions, or Good News Baptist Church, find them on Facebook at Good News Baptist Church.